So far, we created a custom business object “Bonus Plan” with a simple data structure and application UI. This business object is there to save employee specific rules for bonus entitlement. 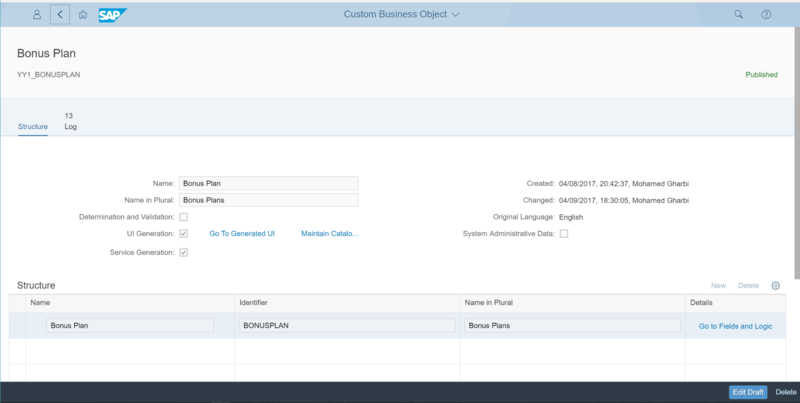 Example: Bonus plan gets an ID automatically and is checked for consistent data. Thanks for this serie of Blogs! When I go to Custom Business Object and go to Fields and Logic I cannot find any section with “Determination Logic”. for logic implementations it’s essential that the custom business object is in status “Published” and a possible draft version (for a change after last publish) was already published again as well. As you do not get the Determination and Validation section at all, I assume you missed to publish the very first version of your custom business object. you have to check “Determination and Validation” (below “Name in Plural”). To be able to do this, you have to “Edit Draft” before. Afterwards you have to publish again and then you will finally be able to do implementations. I am very sorry, that this essential step seems to have gone lost in the blog. I will update it next. I keep getting the error “Class YY9_DAMK_B4C9A49833AF1930BEA8A could not be saved” when I try to save the Implementation. Could you please let me know when does this error occur? Is it related to the user authorization? OR any other syntax error? I can although see that the class mentioned in the error message is already created at the backend. please excuse the late reply, I was sick last week. Sorry, but I cannot provide support on the shown topics, please open a ticket to BC-SRV-APS-EXT-BO in case your issue still persists. As the message is quite generic I fear it can have many reasons. I would exclude a syntax error as this should be marked in the editor already. Great blog and examples here. Can you recommend the best guide for covering the scripting language used here?